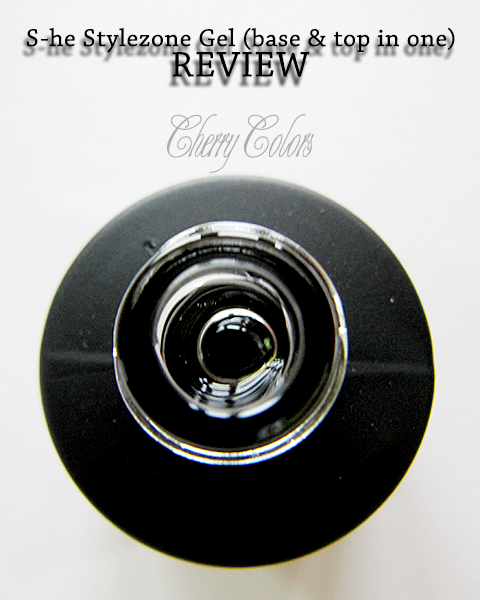 Review: S-he Stylezone 2in1 Base&Top Gel Polish - Cherry Colors - Cosmetics Heaven! Not so long ago, I noticed that our local DM has started carrying a top & base gel in their brand S-he Stylezone. I usually don't check out their stand, because I don't like the packaging (except the super cute/expensive mono eyeshadows). But this time I made an exception, since I had a -30% discount coupon on all decorative cosmetics. The usual price for this gel is a bit less than 6€, which I think is a bit much, especially if you don't know if it is any good. The gel comes packaged in a box, with the regular design from S-he. And inside there's a small black bottle that looks chic. I like the look of it alone (without the ugly box). The bottle holds 7ml of product. 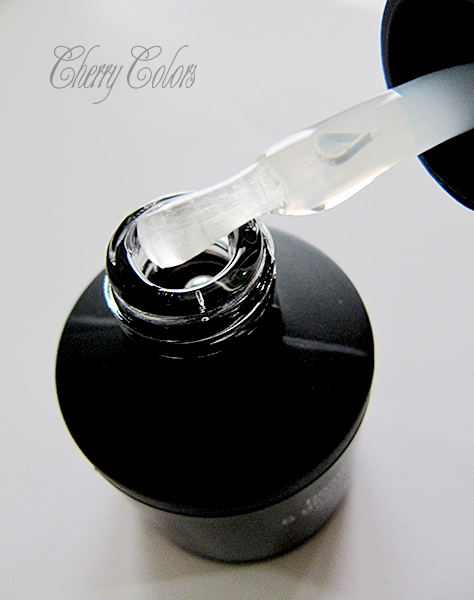 The gel is this clear polish (gel), that is easy to apply. It applies nice and thin and there is little shrinkage. I must say that the application was flawless and I was impressed. This is however not a peel of gel polish. It's a regular gel polish that is supposed to help your regular polish stay on longer. This is why I applied it as a base, cured it under my LED light for 60 seconds and then removed the sticky layer. My nails looked shiny and pretty! I then applied my normal nail polish and waited for it to be completely dry. When my nails were somewhat dry (I am not so good at waiting... ahem), I applied a layer of the 2in1 gel and cured it under my LED lamp. A added another layer of it, because I skipped on the drying time of the polish and I didn't want to lose my manicure in the following hours. The end result was spectacular! Beautiful and shiny manicure. BTW, the polishes I used here, are from the Essence Cinderella TE. Usually I get chipped polish (on very light colors, like this one), after 2-3 days. But with the gel I managed to get a nice looking manicure for more than a week! Isn't thick on the nails! I am happy that I own this product, even if I usually don't feel like going the extra mile to make my manicure last longer. Tho, maybe I should? The same result can be achieved with a regular gel polish - you apply your normal polish over your gel base, once it's cured and cleaned (but you have to wait 24h, to make sure the normal polish is 100% dry, to apply the top gel polish). I feel that this product has potential, but maybe needs a shorter curing time. I mean, okay 60 seconds is not long, but damn, wouldn't 10 second be even better? The price is pretty high, considering for that kind of money, I can get a depend base or top coat or a color.. you know. Anyway, a lovely product for all the ladies that want to use gels with regular manicures, but don't feel like waiting 24h time to finish them with your regular gels.